Q: I am having a problem working out a furniture arrangement for a rather large bedroom (12 feet 9 inches by 13 feet 9 inches) that must accomÂ­modate my two daughters. My 19-year-old daughter has a twin size bed with a tall chest of drawers. My 9-year-old also has a single bed in addition to a small dresser with bookshelves above it and a large desk. 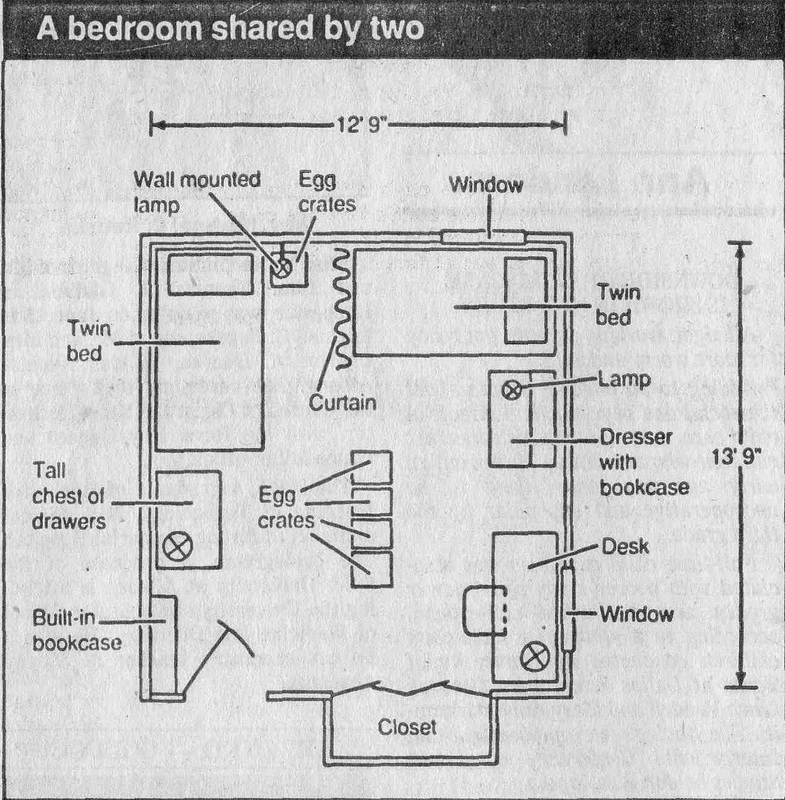 As you can see from the enclosed sketch, there is a built-in bookcase behind the door and a 5-foot closet, but these, in addition to their furniture, will not accommodate all of their belongings. We were thinking of using a group of egg crates to provide extra storage if possible. We are not only faced with the pure logistics of fitting all of these things into the room, but each of my daughters would like her own side as well. I realize that no matter what we do it will be very cramped, but I would 'like it to be as attractive as possible. If you could give us some suggestions, it would be greatly appreciated. A: Your question caught my attenÂ­tion because I think many people face this same problem. When two siblings must share a room, peaceful cohabitaÂ­tion for the entire family often relies upon a successful design solution. Although the room is a good size, it was a challenge to arrange all the existing furniture in a way that would create a certain sense of privacy for each of them and be attractive at the same time. Wall space in this situation is valuable, so I knew from the beginning that the area under the windows would have to be utilized. I also didn't want either one of the beds close to the closet because I'm certain that a 19-year-old and a 9-year-old have very different schedules. I wanted the closet area to be readily accessible to either of them without fear of disturbing the other if she were sleeping. 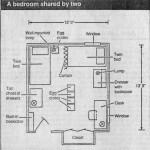 With these things in mind, I posiÂ­tioned the two beds at the far end of the room, opposite the door. One is placed parallel under the window, and the other is perpendicular to it on the inside wall. The dresser with the bookcase works well next to the bed under the window. If you place a lamp on the top, to the left, it will light both the bed and the dresser area. I then put the desk, with another lamp, on the same wall to the far right under the other window next to the closet. It works well there and uses the wall space efficiently. In addition, it also establishes that entire side of the room as your younger daughter's turf. On the wall adjacent to the door, at the foot of the other bed, I put the tall dresser. The height of it partially blocks the view from the hallway providing some privacy for your older daughter. She can now make use of the built-in bookcases behind the door, creating her own space in the room. To further define their separate areas, I used your idea of grouping egg crates but put them right in the middle of the room. They can be stacked five-high in a row of four and can open to either side. They serve as a divider as well as providing the additional storÂ­age you need. Two egg crates can also be used, one on top of the other, next to your older daughter's bed. She could then mount a wall lamp above them for light while reading. To complete the room, I would mount a rod on the ceiling at the foot of your 9-year-old's bed and hang a curtain or simple drapery on it. This could be pulled open or closed as desired. If one of your daughters wanted to sleep, the other could read without disturbing her. This would further ensure their individual sense of privacy. Two final notes. For a room such as this, the extra clutter of draperies at the windows would be too comber-some. I would use simple shades or blinds, perhaps with a patterned valÂ­ance above to match the divider curtain. The spreads could each be a different coordinating color which would help to give your daughters a sense of individuality. It could all be tied together with throw pillows for the beds. Two daughters sharing a room will never be an ideal situation, but I do think this will be functional and will give each of them a degree of privacy. I hope this has been of some help. Please let me know how it works for you.